For the next couple of Fridays, I’m going to review fish sandwiches from various fast food chains. Seems that everyone loves comparing burgers, fries and shakes. I figure it’s time we shed some light on our fishy friends. Just so you know, this isn’t a Catholic/Lent thing. It’s a “Wha–? They sell fish at Carl’s Jr.?” thing. 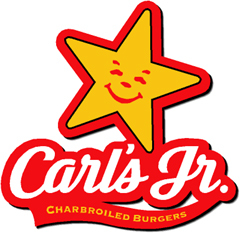 Granted, I don’t ever eat at Carl’s Jr. — aka Hardee’s if you’re reading this from the other side of the Rockies — mostly because I think their food is overpriced and I don’t like to give business to any company that hires Paris Hilton. But I saw a window display for their fish sandwich while driving by, and I decided to add them to my Friday fast-food fishtacular. 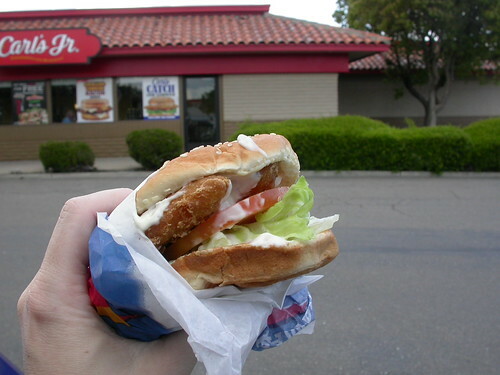 The easiest way to describe the Carl’s Catch: It’s a 710-calorie behemoth that came from beneath the sea. The fried fish portions were large and tender, the lettuce and tomato were fresh and the tartar sauce was decent. It’s the most “mature” fish sandwich, so far; except for the sesame seed bun, it had all the makings and flavor of a sit-down restaurant meal. It cost the same as the Wendy’s fish sandwich, exactly four bucks with tax. And I confess, I got my money’s worth. I was not even slightly hungry for several hours afterward. WARNING: This sandwich seems to follow the Carl’s Jr. mandate: “If it doesn’t get all over the place, it doesn’t belong in your face.” This was a messyass sandwich. The tartar sauce was glopped on thick, and when mixed with the moisture of the tomato, it became a drippy catastrophe. Certainly not a sandwich for the car. Carl's Catch Fish Sandwich, Carl's Jr.
Wouldn’t want that all over my face, really, all over my mouth seems like a better alternative! We don’t have a Carl’s in Montreal; pity because I like fish – and i adore fried fish. let’s make deep deep fried fish! $4.00 ain’t bad. Hope you got pop and apple turnover with that!